In July, when South Florida became the first place in the U.S. to report locally transmitted Zika cases, the eyes of the nation turned to our area and found several FIU experts with deep knowledge and a willingness to help the community navigate the Zika outbreak. Herbert Wertheim College of Medicine Professor Dr. Aileen M. Marty, who is a world-renowned expert in infectious diseases, has been at the forefront of the local response in her capacity as a member of the State of Florida Medical Reserve Corps. In more than 30 years of practicing medicine, 25 of them as a Navy doctor, she has traveled the world, treating diseases like leprosy, dengue, malaria and Ebola. Now, she’s facing another virus – Zika. 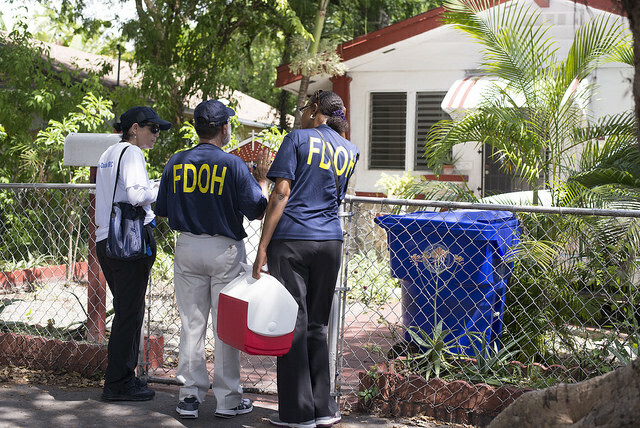 As a part of a surveillance program, Marty has led teams of Florida Department of Health officials, along with other members of the Medical Reserve Corps and volunteer medical students, going door-to-door in Wynwood and other neighborhoods in Miami to test residents for the Zika virus. This work has had a major impact. Their work helped confirm that there was, in fact, local mosquito transmission. “We all know the saying ‘a stitch in time saves nine’ – the idea that you act and address something before it becomes a problem – that’s what the Florida Department of Health has done. It has been on the forefront of understanding and tackling Zika,” said Marty. 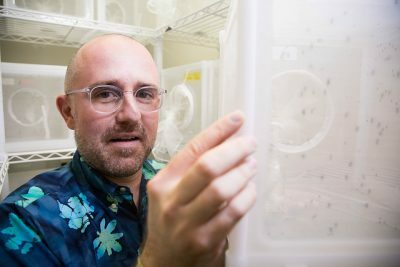 FIU biologist Matthew DeGennaro studies mosquitoes, the world’s deadliest animal and the carrier of Zika. The tiny insects also carry several other mosquito-borne illnesses that account for 725,000 deaths worldwide every year. He is the first scientist in the world to create a mutant mosquito, a feat that has enabled him to study mosquito behavior. He hopes his work in understanding why mosquitoes prefer humans will lead to better repellants. In the meantime, DeGennaro, who conducts his research as part of the Biomolecular Sciences Institute in the College of Arts, Sciences & Education, insists on the importance of using DEET, the most effective mosquito repellant currently on the market. “DEET should be Miami’s new perfume,” said DeGennaro in a recent network TV interview. Since the outbreak was first detected, the local, national and international media have turned to FIU for experts to help explain Zika and calm fears. FIU experts have done more than 100 interviews and reached more than 168 million people around the nation through media coverage worth more than $1 million. Here is some of the latest coverage featuring FIU experts.